You have strolled the Champs-Elysses on a warm spring day, marveled at the stained glass window in Notre Dame Cathedral, ascended to the top of the Eiffel Tower for a panoramic view of the city, and gazed at the Mona Lisa and Venus de Milo at the Louvre (on Sunday, of course, when it is free). You take pride in the fact that you have "done" Paris. You have seen all the sights above ground, and as important and impressive as they may be, they are the same sights everyone else has seen. Now you are ready for Paris - underground. You will stop conversations in mid sentence at the next cocktail party when you start propounding on the complexities of the Paris sewers. Yes, you can be the first in your crowd to visit the sewers of Paris. The entrance is located near the Alma Bridge, at the corner of the Quai d'Orsay, on the left bank. Take the metro, a pleasant underground experience in itself, to Alma-Marceau and cross the bridge to the Place de la Resistance. Look for the sign, "les Egouts de Paris". But, before you go, check with the hotel desk clerk to see when it is open. He will be impressed with your knowledge of the finer points of Paris. The sewers are only open a couple of afternoons a week and usually one Saturday a month. Needless to say this in not an expensive tour and you won't have to wait in long lines. By the way, this is no place for your new white shoes. It is a sewer. It is wet and slippery. The tour consists of a view of a 200-meter section of the sewer, but the whole intricate system is explained in minute detail. The guide makes reassuring comments. "Zee section contains only water from zee storm drains. Zee drippings you ask? From zee rain, of course." When did it rain last? It is really quite amazing when you stop to think about it. The entire beautiful city of Paris sits atop a labyrinth of water filled canals. Do, or have, people lived in the sewers? Of course, "viva la de resistance". There is a small museum devoted to the history of the sewers and even a multi-language video presentation. When you emerge to ground level, you will be an authority on the sewers of Paris - a very elite group! Surely, this is one of the weirdest tours you will ever take... ... that is until you visit the Catacombs of Paris - "Les Catacombs de Paris". This macabre walking tour requires the same spirit and footwear as the sewer tour. With luck and planning you can do both tours on the same day. This tour is a little more popular so the wait may be longer but nothing compared to the line at Space Mountain in Disney Land. However, this tour may grow in popularity, especially now that the Disney film, The Hunchback of Notre Dame, used the catacombs for the setting for the climactic ending of the film. The Catacombs are open most days but not necessarily every day. So, once again, have the desk clerk at your hotel check for you. It might be best to wait until a different clerk is on duty! Take the Metro to "Denfert" stop. 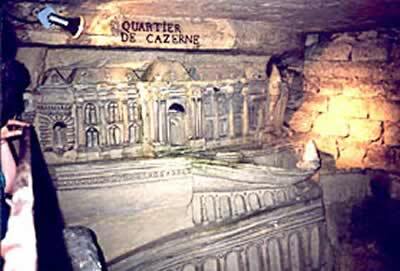 The Greco-Roman catacombs are under the left bank at 2 pl Denfert-Rochereau. There is a little museum/book shop at the entrance. If you see anything you want, buy it right then and there. Don't wait until the tour is over because the path winds through the limestone to a narrow circular stairway that leads to the street. The exit is at an entirely different spot than the entrance. It is not around the corner from the entrance, either. The entrance bears the sign, "Arrete, c'est 1'empire de la mort". You don't have to read French to figure that one out. It doesn't say, "Have a nice day." The one-hour walk will take you past the remains of millions of Parisians. As the city of Paris grew, land that had been used for cemeteries was needed for other purposes. The interred were disinterred and their bones were brought to the Catacombs where they were reverently stacked, skull upon skull, and labeled by year of burial. 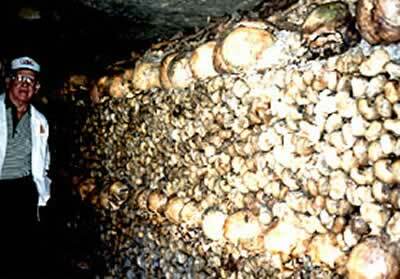 Actually, the Catacombs started out as a tomb near the end of the 18th century. Many victims of the French Revolution are buried here. You might want to bring your own flashlight if you think you might want to peer into the dark nooks and crannies. The sewers and the Catacombs - two unusual, to say the least, tours. This could start a whole new trend. The sewers of New York, ...of Calcutta, ...of London, ...of Cairo. The possibilities are endless.